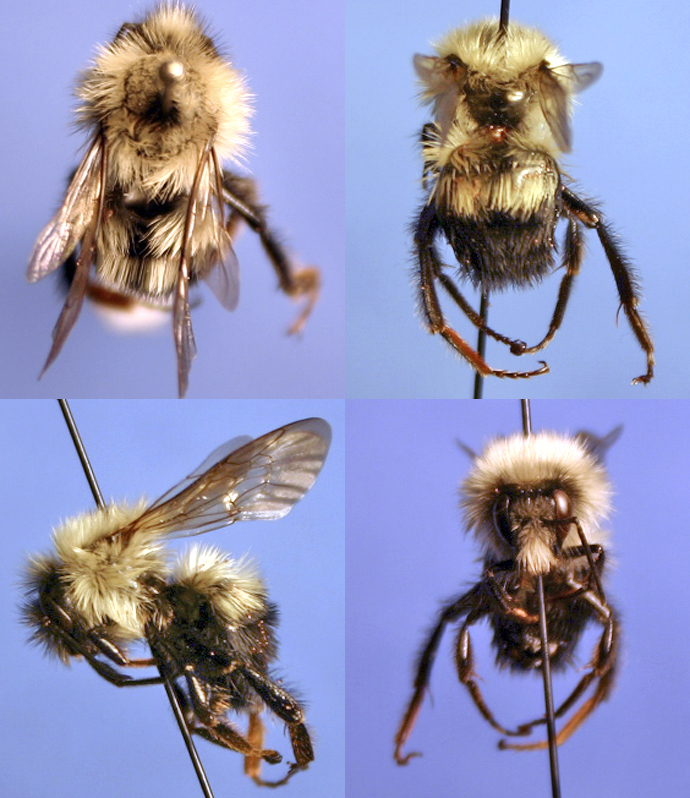 Bombus vagans. Macoupin County, Illinois, 8 August. Queen: Face with black and yellow hairs intermixed, vertex with yellow hairs predominating. Dorsum of thorax yellow except for a smooth and shining bare spot on the disc, which often has a few black hairs surrounding it; pleura with yellow hairs to the bases of the legs. Abdomen with tergites 1 and 2 entirely covered with yellow hairs, the remaining tergites black. Venter black; legs usually black, but often with a sprinkling of yellow hairs. Worker: Very similar to the queen, but usually the interalar area has more black hairs mixed with the yellow hairs surrounding the smooth and bare disc. VARIATION: The queen and workers of variety helenae Frison have tergite 5 totally yellow instead of black. Male: Face and vertex with yellow hairs, a few black hairs intermixed; cheek largely covered with yellow hairs. Thorax a sin the female. Abdominal tergites 1 and 2 entirely yellow, the remaining tergites black except for a few yellow hairs on the sides of tergites 5 and 6. Venter and legs with some black, but mostly with yellow hairs, corbicular fringes strongly tinged with ferruginous hairs. VARIATION: variety helenae (some yellow on the last 3 tergites) and variety coctus Bequaert & Plath (some ferruginous hairs on tergites 5-7). Queens of B. vagans can be confused with those of B. affinis, but B. vagans has long, shaggy hair and is much smaller than B. affinis. This is a rather late-appearing species, with queens first recorded on May 4 in Wisconsin (Medler and Carney 1963). Nesting occurs at or below ground level. Up to 70 workers may be present in a nest. Bombus (Psithyrus) citrinus parasitizes the nest of this species. Queens: . Workers: . Males: . Queen: apple and plum; workers: red clover; males: goldenrod and aster.